On a typical day in Minnesota, about 83 people are injured in crashes – one every 14 minutes. Riding in a motor vehicle is one of the most dangerous things most of us will ever do and we typically do it every day. Last year, 368 people got in their vehicle to go somewhere, but they never made it. They lost their lives on a roadway in Minnesota. 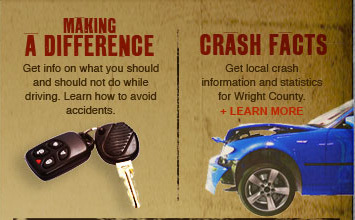 Safe Communities of Wright County (SCWC) is working to change the odds of crashes and the resulting injuries and fatalities. 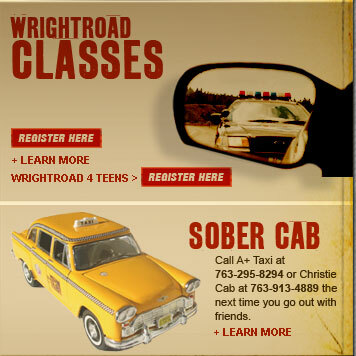 Since its inception in 1997, it has sponsored innovative traffic safety initiatives throughout Wright County and its efforts are being felt for each citizen and driver who passes through. The number of severe injury and fatality crashes have dropped by over 40% percent since 1997. That statistic has remained constant despite for a time Wright County being identified as one of the fastest growing counties in the Unites States. As Wright County continues to grow in population, the number of vehicles on our roadways also increases and the need to drive defensively becomes more and more important. We all need to be aware of our responsibilities as drivers and remember that crashes are not accidents; they are preventable. There is much that can be done to make our roads and driving safer. As individuals, every Wright County resident can buckle up, drive the posted or safest speed, pay attention only to driving while driving, drive sober, and follow traffic laws, which are enacted for all our safety. If we all do our part, we will truly live in a safe community.